Epidemiologic data and conclusions are, of course, important. Indeed, the scientific basis to many of the plaintiff’s cases rests on observational epidemiological studies demonstrating elevated odds ratios in the range of 1.2 – 1.3. Plaintiff experts urge that that these epidemiological studies, taken in conjunction with mechanistic data, support the view that carcinogenesis arises from exposure to the talc mineral (as well as to asbestos contamination). Defense experts counter that the epidemiological studies suffer from recall bias, and that the mechanistic studies fail to support the role of talc in causing ovarian cancer. Since both sides can find things to like in the epidemiologic evidence, one might expect efforts by both sides to use genetics to tip the balance one way or the other. Indeed, genetic factors related to ovarian cancer are emphasized by some book chapters and review articles on the etiology of ovarian cancer. Nevertheless, genetic data have not been highlighted in most of the legal battles. Therefore, one might ask why the lawyers are not pointing to genetic factors in the trials? We cannot answer that question because we do not call the trial shots for either plaintiff or defense lawyers, or their clients. However, we can provide a brief overview of some of the more recent data linking genetic factors to the etiology of ovarian cancer. 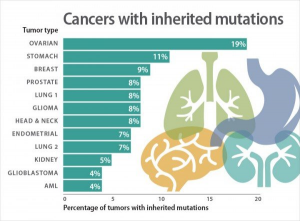 Clearly, many cancers arise in persons who inherit specific genetic mutations. Stated another way, the literature indicates that, in general, a substantial portion of the risk of developing ovarian cancer is hereditary. A recent analysis found that of 12 commonly occurring cancer types, ovarian cancer was the most heritable. Specifically, nearly one in five ovarian cancers were associated with inherited mutations, as in the chart below. This finding highlights the important role that genetic data can have in any toxic tort legal case involving ovarian cancer. It’s also true that certain inherited genetic mutations are more important than others. For example, studies demonstrate that BRCA1 and BRCA2 mutations predispose individuals to ovarian cancer as well as to breast cancer. This increased risk arises because “normal” BRCA1 and BRCA2 genes provide the formula for production of tumor suppressor proteins (also referred to as hormones) that repair damaged DNA. If a genetic mutation interferes with the ability of BRCA1 or BRCA2 to produce these hormones, then the DNA repair process is impaired, and the individual is more likely to present with specific cancers that are normally suppressed (ovarian cancer being one of them). To give a sense as to the power of these mutations, about 1.3% of women in the general population will develop ovarian cancer sometime during their lives. This risk increases to about 44% in women who inherit a harmful BRCA1 mutation and about 17% in women who inherit a harmful BRCA2 mutation. However, one must keep in mind that researchers have known for many years that different BRCA mutations and their impacts also vary [Thompson D, Easton D; Breast Cancer Linkage Consortium. Variation in BRCA1 cancer risks by mutation position. Cancer Epidemiol Biomarkers Prev. 2002 Apr;11(4):329-36]. We presume this type of detailed information will move into courtrooms over time, as lawyers and clients more fully appreciate the importance of and nuances in inherited (germline) mutations. We expect to see both plaintiffs and defendants highlight the role of genetics in the induction of cancer, and to argue about whether inherited genetic factors of themselves can (or cannot) drive the occurrence of specific cancers independent of exposure to alleged toxicants like talc. Certainly, that issue already was argued in a 2016 trial of a mesothelioma case (Ortwein) that ended up settling after some but not all the proposed expert testimony on the impact of a BAP1 mutation. Ovarian cancers and BRCA genes are only some of the cancers for which inherited genes mutations may warrant scrutiny in some or many fact patterns Indeed, there are numerous risk factors and genetic hereditary cancer syndromes that can be relevant to a toxic tort case, including the following: hereditary breast and ovarian cancer syndrome, PTEN tumor hamartoma syndrome, hereditary nonpolyposis colon cancer, Peutz–Jeghers syndrome (PJS), MYH-associated polyposis (MAP), and Li-Fraumeni Syndrome. Looked at individually, each of these hereditary syndromes is relatively rare. However, they may be pertinent to understanding and explaining a particular cancer in a particular person. The power of a genetics approach is that it allows the study of these questions in a precise, rigorous and quantifiable manner for a particular person, as opposed to a population. As genetic data moves into mainstream legal cases, it’s increasingly easy to associate gene ABC with cancer type XYZ. We are delighted to see the spread of genetic knowledge; it was discouraging five years ago when some people literally knew nothing about mesotheliomas and BAP1 genes. Now, with that base of knowledge starting to broaden, it’s important for more people to think more broadly about the role of “genomics” in tort cases and to ask broader questions. As lawyers expand their knowledge of genetics, it will become increasingly apparent that there are potential questions and answers. For example, there are many different mutations of the BRCA gene and they are not all equivalent. Some BRCA mutations are extremely lethal and others much less so. Therefore, it can be important to ask questions about the specific characteristics and identity of an inherited mutation. If a person with ovarian cancer is a potential plaintiff seeking counsel, lawyers may well need and want to ask if she has been through genetic testing and may want to really understand the findings that emerged from that testing. Lawyers and clients also will want to look beyond single genes, and to think more broadly. For example, it may be even more informative to ask questions about combinations of genes instead of just single genes. To that end, we are creating customized gene panels that can provide more answers to more questions at a much lower cost per answer, if the questions are asked relatively systematically instead of as “one off” questions. Similarly, we are looking beyond the single gene literature to studies that present provocative findings about molecular and genetic factors that vary based on factors unique to fathers and mothers. Investigations that go beyond a single gene could provide highly useful data, at least for some persons and some cancers. For example, looking beyond single gene factors could potentially explain why so many women develop ovarian cancer but do not have the typical, well-known mutations, such as BRCA1 and BRCA2. More ahead on those and other topics as 2018 unfolds.